Over-the-air (OTA) measurements are commonly used to determine the wireless system performance of wireless-enabled devices aside from field testing. LTE has introduced MIMO in order to improve network performance. 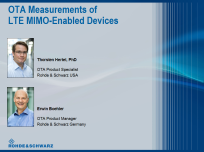 This webinar presents a straightforward and cost-effective solution for LTE MIMO OTA testing to rank radiated MIMO performance. The LTE MIMO OTA decomposition approach determines separate figures of merit for the key MIMO receiver chain subsystems: the MIMO antenna subsystem using the radiated approach and the MIMO receiver using the conducted approach. The webinar focuses on the radiated approach, which takes arbitrary angles of arrival (AoAs) for the MIMO streams into account and provides sufficient control over the AoAs in 3D.